I have been so bad about the blog since I returned from Italy. I wanted to write all about Florence and Venice, but I never got around to it and it seemed more more overwhelming as I got further from it. So, as suggested by my friend Dr. Marc, I need to just move forward and start blogging again. Besides, what happened this weekend really merits a good flogging. Steve and I went up to visit his friends in Maine. They have a nice cottage on Owl's head, which is a lovely 20° cooler than Boston. 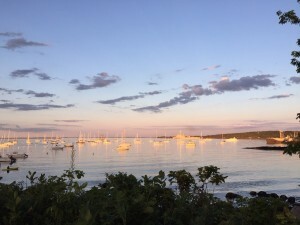 Our visit happened to coincide with the annual Maine Lobster Festival which is held in Rockland every year. When we arrived on Friday night, we got 11 pounds of steamers from Ship to Shore, and ate them back at the cottage for as an appetizer before heading to the 'Keag, a grocery store that serves a mean crab meat sandwich. The sandwiches were made of hand-picked crabmeat with just a dollop of mayo, on a grilled bun. My large sandwich was enormous and a bargain at eight bucks. The next day we went to the Lobsterfest parade, which had four different displays of old men in tiny little go-carts driving around. My favorite was the Crush Station, a lobster themed monster truck. I got a hot dog with everything ($2.50) from Wasses to tide me over. 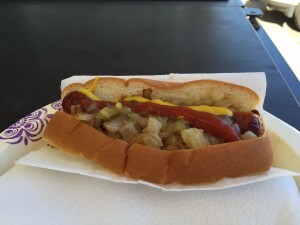 A hot dog with everything means mustard, relish, and caramelized onions. There are several signs that remind you that you have to specifically ask for ketchup. The hotdog is a blend of beef and pork and had a decent snap contrasting with the nice squishy steamed bun. Later that night, we went to Archer's on the Pier for a drink and we were seated at the bar next to a 70-year-old woman telling dirty jokes. The place was packed and had a fun, festive vibe with an amazing view of the water. We left the restaurant and walked along the harbor to make our 9 PM reservation at the Oyster Bar at the Pearl, a new restaurant that is literally within the grounds of the Lobster Festival. The moon was low in the sky, bigger than I've ever seen it, and blood red. We arrived and the restaurant was virtually empty, which is shocking given that the Lobster Festival is the biggest tourist weekend Rockland will see all year. We couldn't find a hostess, but eventually someone sat us on the back patio at a dirty table. I had to ask the waitress to wipe it down before she attempted to put down our napkins and silverware. There was no one else out there. We ordered our drinks and they came in plastic cups, even the wine. Can you believe it? Wine came in plastic Dixie cups – it was outrageous. We had to ask the waitress to bring us real wine glasses. When it came time to order, she informed us that they had not turned on their wood fire oven and therefore half of the small menu was not available. 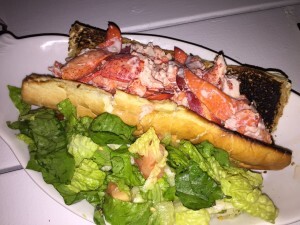 I ordered the lobster po'boy ($22). It was essentially a large lobster roll, with a decent amount of claw meat tossed in mayo, but the bread was soggy. I was supposed to get potato salad, but that never arrived. The BBQ shrimp sandwich was made with canned shrimp, and Steve's pork chop was small and dry. At 10pm, the owner came over to let us know they were closing and we should finish up. This was shocking – why schedule a 9pm reservation, only to try to kick us out at 10pm, mid-meal?! We finished our food and left without dessert. On the way out, Steve's friends attempted to give the owner some feedback about our poor experience and that dissolved in to obscenities. She stated that there was no reservation in the book and accused us of lying about making it. Needless to say, we should have stayed at Archer's. I read that it is new ownership – they will learn very quickly this is not the way to do business.